Get ready for the next prime of your life! So how do we ensure that our bodies remain fit, our minds alert and creative, our finances stable-even growing-throughout our senior years? 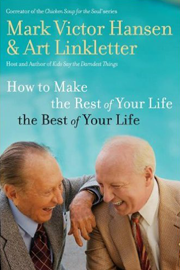 TV icon Art Linkletter (incredibly active in several enterprises at the age of 94) and Chicken Soup for the Soul® co-creator Mark Victor Hansen team up to show us how. Much more than a pep talk about maintaining a youthful attitude in our Second Prime, How to Make the Rest of Your Life the Best of Your Life provides tools we can use: strategies, self-tests, worksheets and resources, plus dozens of inspiring stories and humorous anecdotes. Woven together by the authors' own invincible spirits, these empowering principles come alive as Hansen and Linkletter motivate us to find greater purpose and passion in what we do, making the rest of our lives the best ever.